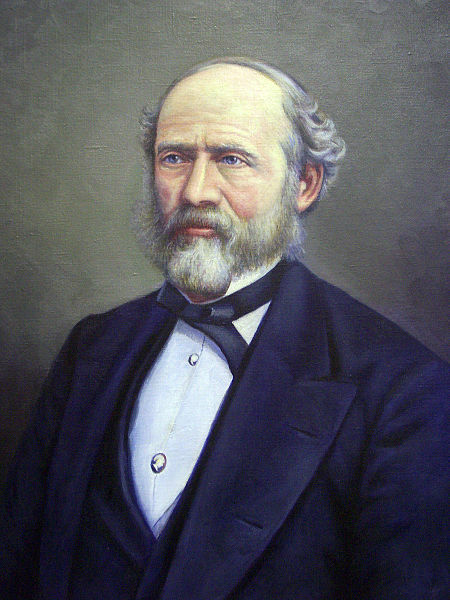 Lewis Henry Morgan was born in upstate New York in 1818, he was raised there until he left for Cayuga Academy and then to Union College where he studied law and the classics. Morgan was not only an academic but also very involved in the local communities, specifically the Seneca. He was a champion of progressive thought about "primitive" cultures and the value that they held. Through his work and friendships with the Seneca people and later other groups Morgan developed the first comprehensive study on kinship systems and terminology called, Systems of Consanguinity and Affinity of the Human Family. Throughout his lifetime he wrote many books and was interested in a wide range of topics from the theory of cultural evolution to the intimate lives of beavers. As one of the first American anthropologists and social theorists Morgan brought up new issues. He represents the struggle that exists for anthropologists everywhere today, the outsiders influence. Should there be an active preservation of culture or should there be a push towards "modernization" and what is the role of the anthropologist in that debate? Although Morgan became friends with Seneca people and was seen as someone who was bridging the gap between cultures, his money was invested in a railroad company that was tracking through Indian land and settlements. Today Morgan might not be viewed as progressive but he was concerned with cultural equality and validity at a time when most other anthropologists saw these "others" as sub-human. His dedication to the University of Rochester also showed his progressive nature. In 1881 his final will bequeathed his fortune to his wife and son for use in their lifetime and stipulated that the remainder be donated to the University in order to establish a woman’s college. He also left his entire library, including all his manuscripts, published and unpublished, scrap books and bookcases for the student’s use now located in the rare books section of Rush Rhees. In 1963 the Lewis Henry Morgan Lectures were established by the Department of Anthropology as a tribute to his life’s work and dedication to the University of Rochester. For more information see the Lewis Henry Morgan biography on fampeople.com.